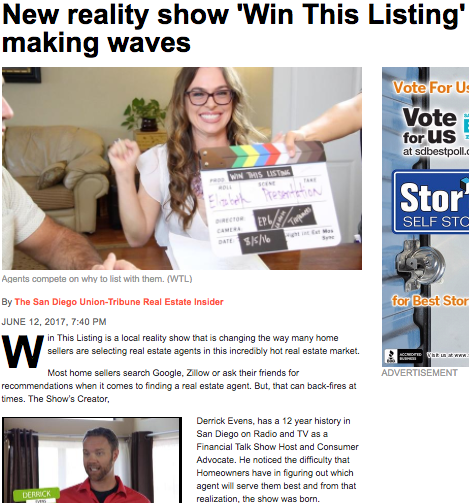 Win This Listing is a TV Show filmed in San Diego County, which airs on Channel 4 Friday nights at 11:00pm. The goal of the show is to help Homeowners sell their property for above market value. The Show will cast 3 qualified real estate agents, then put the agents through a competitive process to “win” the opportunity to sell your home. Agents are cast on the Show based on whom we believe will perform best given the circumstances. The Agents are eliminated on the show one at a time at the Homeowner’s discretion until only the winner remains. Find out what our Homeowners had to say about their experience on the show by clicking here. The show is hosted by Derrick Evens, long-time consumer advocate and Financial Talk Show Host. There are no scripts, no re-takes, everything is 100% REAL – the way Reality TV is supposed to be! You can watch past episodes online by clicking here.